I have had garlic soup on my mind for a while now and came across this hybrid from Rick Bayless. It captures a little bit of Spain and Mexico both in the bowl. I used it as a starting point to turn it into a vegan soup. Replacing chicken broth with veggie broth was easy. According to Bayless, the eggs stirred at the end are put their primarily to make the soup silky and creamy so I replaced them with cashew cream--which also subs well for the richness of the cheese. 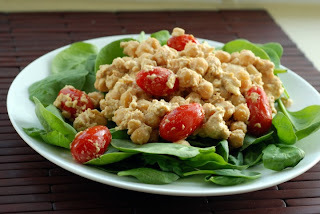 I also added canned chickpeas and baby spinach for extra satisfaction and nutrition. (All of my changes are in red below.) 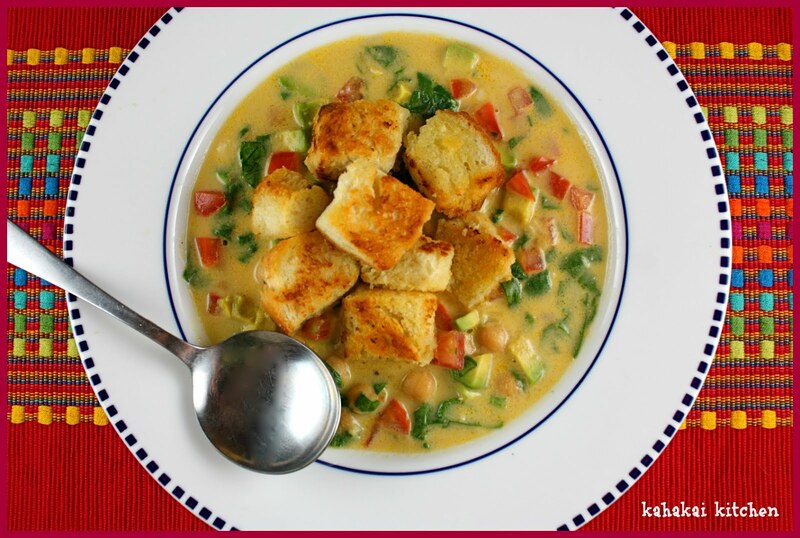 The result is am aromatic and tasty bowl of soup--perfect for a light but filling lunch of dinner. 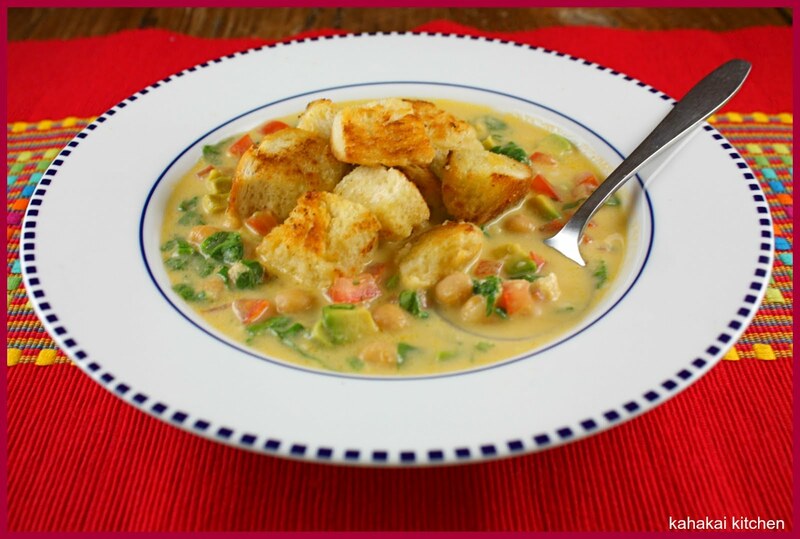 Rick Bayless says, "A warming bowl of this quick-to-make brothy restorative shows a spirit that's both Spanish and Mexican: Spanish in substance (garlic soup with croutons and egg is one of Spain's standards), Mexican in vitality (avocado and tomato are the Mexican breath of life)." Heat olive oil in a small heavy pot over medium low, add garlic and cook very slowly until garlic is very soft and golden, 15-20 minutes. (Don't overcook or burn--garlic should be soft and almost gooey.) Strain the garlic through a medium mesh strainer and set oil aside (you will need 3 tablespoons for the croutons). Transfer garlic to a medium-sized saucepan (2 to 3 quart) and stir in the broth, partially cover and simmer over medium heat 30 minutes. To make croutons: Turn the oven to 325 degrees. While soup is simmering, cut the bread into 1/2-inch cubes and toast on a baking sheet in the oven until thoroughly dry but not real brown, about 20 minutes. Drizzle with about 3 tablespoons garlic oil, toss to coat and return to oven for 5 minutes more until nicely golden. To finish the soup: season with salt. Dive the tomato, avocado and whatever else you are using into bowls. A few minutes before serving, move the soup from the heat, let stand 30 seconds to cool a bit, stir in the eggs with a spoon (They give the broth body and creaminess), then ladle into the bowls. (I stirred in the cashew cream, chickpeas and baby spinach and warmed through.) 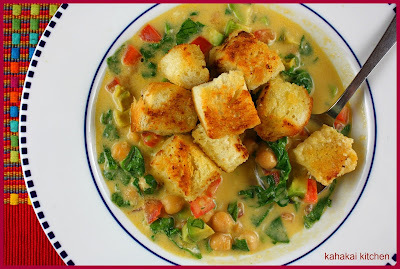 Ladle soup into bowls and top with croutons and chipotle if using. Serve. Notes/Results: Creamy, nicely garlicky and satisfying. Using the cashew cream made the soup silky--like eggs would have and rich enough not to need the cheese. It's a great combination of textures with the chickpeas, tomato and creamy avocado and the crunchy croutons on top. I left out the chipotles on top, but added hot sauce to taste for a bit of spice. A relatively quick and easy soup to make and I would definitely make it again. Let's check out who is in the Souper Sunday's kitchen this week. 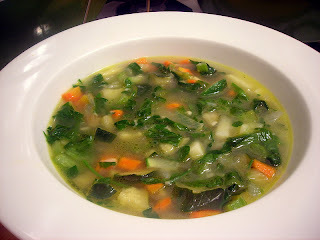 Stash of Simple Kitchen Seasons is here with Zucchini and Escarole Soup (Minestra di Zucchine e Scarola) and says, "Soup is one of the easiest things in the world to cook. I often wonder why more people don’t make it at home.Unlike a minestrone, this is meant to be a first course. You can add rice, pasta, beans or increase the amount of potato to make it heartier. Or add pancetta, sausage or ham in the beginning if you’d like a “meat-y” flavor in addition to the vegetables." Tigerfish of Teczcape- An Escape to Food offers up a colorful Watermelon Basil Salad and says "In my mind, I wanted to combine watermelon and basil in a salad and as I searched the Internet, the recipe from Chef Marcus Samuelsson stood out - just what I was looking for in terms of availability of ingredients and ease of execution. 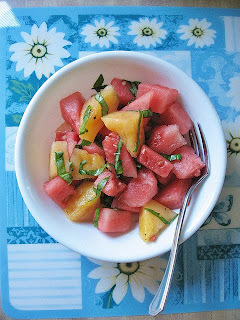 Watermelon, fresh basil, extra-virgin olive oil, salt and ground black pepper were called for. I left out the olive oil and the salad was still as refreshing and bright." Janet of The Taste Space made this hearty Chickpea and Tofu Tahini Scramble Salad and says, "To celebrate all things vegan, I am sharing a non-traditional yet homely rendition of a classic vegan dish: tofu scramble. This one uses both chickpeas and crumbled tofu as its base and is coated in a delicious lemony-hummus-tahini sauce. Pan-roasted tomatoes add a nice burst of sweetness and I tossed this all over fresh baby spinach. I have also made this with the spinach wilted into the dish, which was also lovely." 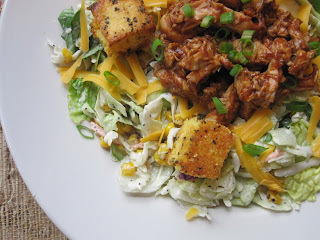 Barbeque Chicken Salad with Cornbread Croutons is on the menu over at Stirring the Pot. 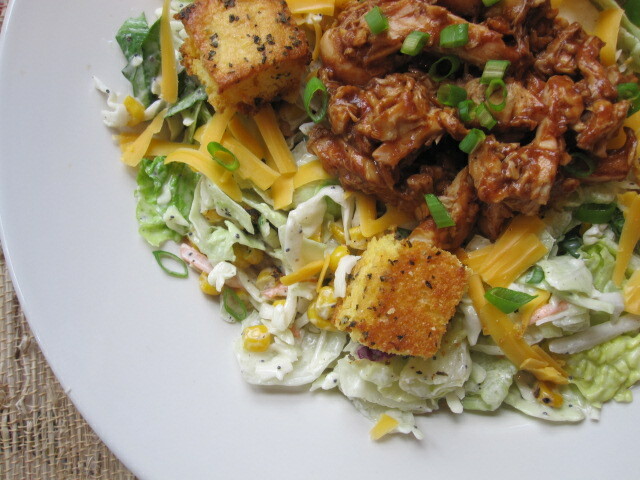 My pal Kim says, "This salad has all the components of your favorite barbecue. Lettuce and coleslaw are mixed with red onion, corn, poppy seeds and coleslaw dressing to create a creamy and textured base for this salad. The salad is topped with a blend of cheddar and Monterey Jack cheese and graced with a sweet and smoky mound of tender barbecued chicken. The crowning glory is the buttery, garlicky, crisp cornbread croutons. It's like a party in your mouth!" 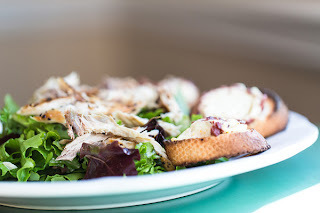 Finally Pam from Sidewalk Shoes has a delicious Smoked Trout Salad with Goat-Cheese Croutes to share this week and says, "I love a salad for dinner, especially on a Friday night. It gets me ready for the usual over-eating I do on a weekend. The trick is finding a salad that leaves me feeling virtuous and hubby not staring at an empty plate five minutes later with his stomach still growling. This salad is perfect. My store didn’t have any smoked trout, but they did have some smoked mackerel. So, it was a wonderful, fatty fish that gave that full, satisfied feel. Then you have the creamy, tangy goat cheese, and the crisp bread. It was truly delightful"
Thanks to everyone who joined in this week. If you have a soup, salad or sandwich that you would like to share, just click on the Souper Sundays logo on the side bar for all of the details. 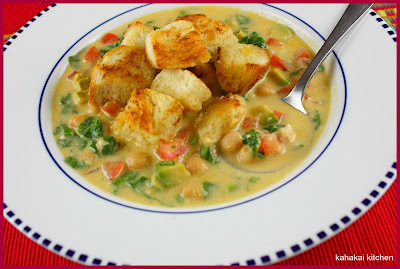 Yum- a nice creamy and comforting bowl of garlic soup (looks like you and I were craving garlic last week). I'm still intrigued by the idea of cashew cream. I'll have to try it one day when Jackson isn't around (he's becoming more and more sensitive to nuts). Thanks for adding me to the roundup!! So Deb...make me lunch? I love garlic soup. Your idea to add spinach is perfect. My favorite vegetable bathed in garlicky broth. Sigh. Mmm, garlic! I love your additions, very hearty and delicious. Looks so yummy! This is one to put on the "when it cools off" list!